O most amiable Heart of Mary! which of all hearts most perfectly resembles the Heart of Jesus, and is thereby worthy of the love and respect of all creatures, to thee I fervently consecrate my heart, and I choose thee, after the Heart of Jesus, for the object of my imitation and confidence. I beseech thee, O sacred Virgin! by all the graces which were bestowed on thee by thy beloved Son, to give me a passage through thy blessed heart to the Heart of Jesus. Lead me thyself into that adorable sanctuary, that I may learn to practice the virtues which rendered thee so faithful a copy of Him who was meek and humble of heart. Thou knowest that I wish most sincerely to venerate, to love, and to imitate that divine Heart, which was the source of all thy merit and happiness, as well as the only object of thy love; but as I feel my own weakness, I have recourse to thee, beseeching thee to present my heart to Jesus in union with thine; that in consideration of thy perfections and merits, my miseries and sins may be overlooked, and my heart for ever consecrated, through thee, to the perfect love of my Creator. I choose thee now, O holy Heart of Mary, for my advocate and model, that thy prayers may assist me to imitate thee, and thereby conform my heart to that of my divine Saviour. Thou wert, O most pure Heart! happily inaccessible to the monster sin! yet thou art penetrated with humiliation and sorrow for the sins of the world: obtain that my heart may be truly contrite for my own sins, and may love God sufficiently to feel and deplore the sins of others. Thou wert replenished with the meekness and mercy of the Heart of Jesus, and consumed with his most ardent love; therefore through thee I most firmly hope to receive a share in those virtues; and above all, the grace to detest the vice of pride, which would render me so hateful to the adorable Heart of Jesus, and to practise that sincere humility which can best liken me to my Saviour and to thee. In thee, O blessed Heart of Mary! I will confide during my life, and in thee also I confidently hope to find a secure refuge and powerful advocate at the hour of my death. Click here, to know about & join the Archconfraternity of the Immaculate Heart of Mary. 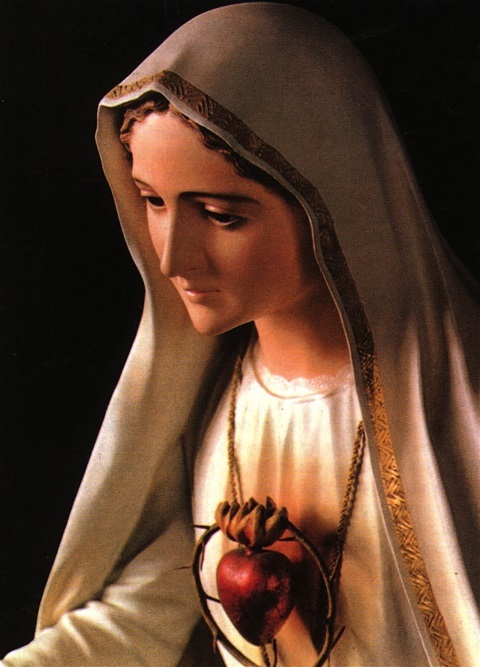 Click here, on how to Practice/Spread Devotion to the Immaculate Heart, according to the Message of Fatima. August 1: St. Peter in Chains, Greater Double; Commemoration of St. Paul; Commemoration of the Holy Machabees Martyrs. August 2: St. Alphonsus Mary of Liguori Bishop, Confessor, and Doctor of the Church, Double; Commemoration of St. Stephen I Pope and Martyr. August 3: Invention of St. Stephen Protomartyr, Simple. August 4: FIRST FRIDAY/St. Dominic Confessor, Greater Double. August 5: FIRST SATURDAY/Dedication of Our Lady of the Snows, Greater Double. August 6: Transfiguration of our Lord Jesus Christ, Double of the II Class; Commemoration of IX Sunday after Pentecost; Commemoration of Ss. Xystus II Pope, Felicissimus and Agapitus Martyrs. August 7: St. Cajetan Confessor, Double; Commemoration of St. Donatus Bishop and Martyr. August 8: Ss. Cyriacus, Largus and Smaragdus Martyrs, Simple. August 9: St. John Vianney Confessor and Priest, Double; Commemoration of the Vigil of St. Laurence; Commemoration of St. Romanus Martyr. August 10: St. Laurence Martyr, Double of the II Class. August 11: Commemoration of Ss. Tiburtius and Susanna Virgin, Martyrs. August 12: St. Clare Virgin, Double. August 13: X Sunday after Pentecost, Double; Commemoration of Ss. Hippolytus and Cassian Martyrs/Delay in 4th Fatima Apparition by Six Days. August 14: Vigil of the Assumption of Mary; Commemoration of St. Eusebius Confessor. August 15: Assumption of the Blessed Virgin Mary, Double of the I Class. August 16: St. Joachim Father of the Blessed Virgin Mary, Confessor, Double of the II Class. August 17: St. Hyacinth of Poland Confessor, Double. August 18: Commemoration of St. Agapitus Martyr. August 19: St. John Eudes Confessor, Double/Centenary of the 4th Apparition at Fatima. August 20: XI Sunday after Pentecost, Double; Commemoration of St. Bernard Abbot, Confessor, and Doctor of the Church. August 21: St. Jane Frances de Chantal Widow, Double. August 22: Immaculate Heart of the Blessed Virgin Mary, Double of the II Class; Commemoration of Ss. Timothy, Hippolytus Bishop, and Symphorianus Martyrs. August 23: St. Philip Benizi Confessor, Double. August 24: St. Bartholomew Apostle, Double of the II Class. August 25: St. Louis King, Confessor, Simple. August 26: Commemoration of St. Zephyrinus Pope Martyr. August 27: XII Sunday after Pentecost, Double; Commemoration of St. Joseph Calasanctius Confessor. August 28: St. Augustine Bishop, Confessor, and Doctor of the Church, Double; Commemoration of St. Hermes Martyr. August 29: Beheading of St. John the Baptist, Greater Double; Commemoration of St. Sabina Martyr. August 30: St. Rose of St. Mary Virgin of Lima, Double; Commemoration of Ss. Felix and Adauctus Martyrs. August 31: St. Raymond Nonnatus Confessor, Double.